Another winner from the Smitten Kitchen, but this time from the cookbook, not online. Like Deb’s spouse, my husband also doesn’t care for fruit with his meats, but since her hubby loved it, I thought I’d give it a try. William’s verdict – home run! I made lemony roasted parsnips to go with the chicken. Preheat oven to 450°. Heat olive oil in a large caste iron pan. Sprinkle chicken with salt and pepper, then add to the pan. Brown until golden on each side, working in batches, removing browned pieces to a plate while you do the rest (don’t crowd your chicken pieces while browning – you’ll get better results this way). Arrange all chicken pieces back in the pan. Add grapes, olives, shallots and rosemary. Place pan in oven and cook for 20 minutes, until pieces are fulling cooked. 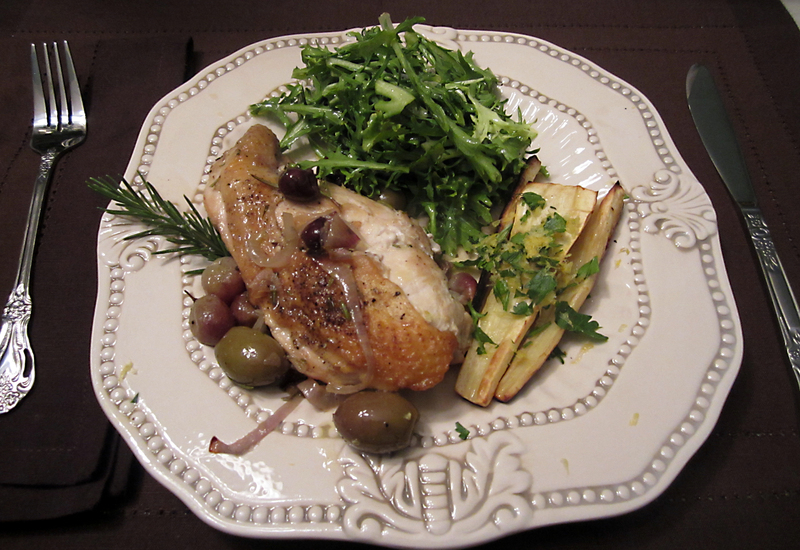 Remove pan from oven and place chicken, olives, and grapes to a platter. Add wine and chicken stock to the pan juices and bring to a boil. Allow to cook until reduced by half, then spoon over chicken. Heat oven to 450°. Peel several parsnips, then cut in half length-wise. Arrange in a roasting pan and drizzle with olive oil. Roast for 20 minutes. In the meantime, zest a lemon into a small bowl. Add a half cup of fresh, chopped flat-leaf parsley and a tbsp. of salt. After platting the parsnips, sprinkle with the lemon zest, salt & parsley mixture.